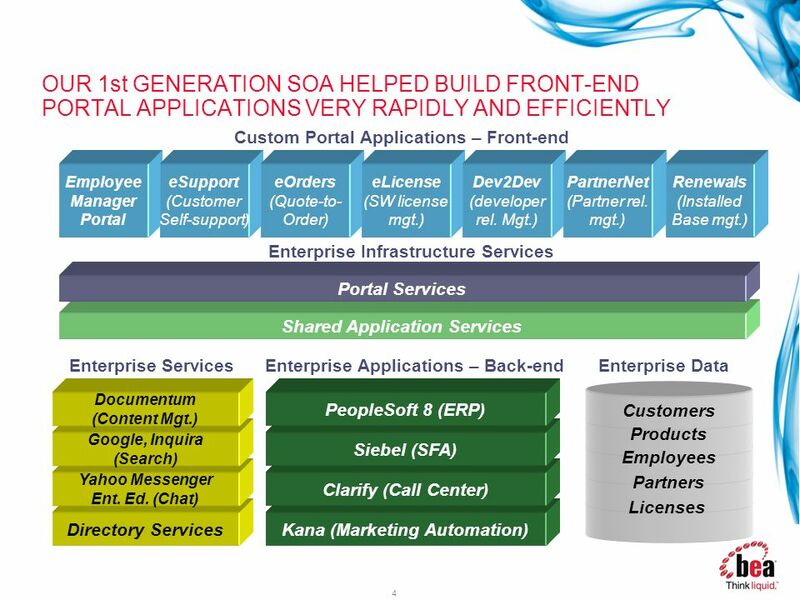 SOA Maturity Model Yogish Pai CTO,BEA-IT. 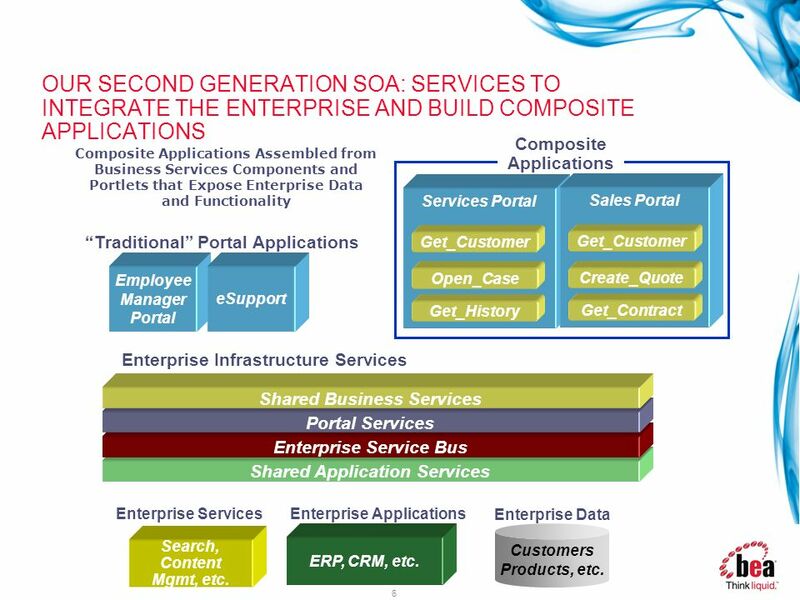 OUR SECOND GENERATION SOA: SERVICES TO INTEGRATE THE ENTERPRISE AND BUILD COMPOSITE APPLICATIONS Composite Applications Assembled from Business Services Components and Portlets that Expose Enterprise Data and Functionality Composite Applications Services Portal Sales Portal Employee Manager Portal eSupport “Traditional” Portal Applications Get_Customer Get_Customer Open_Case Create_Quote Get_History Get_Contract Enterprise Infrastructure Services Shared Business Services Portal Services Enterprise Service Bus Shared Application Services Enterprise Services Enterprise Applications Enterprise Data Customers Products, etc. Search, Content Mgmt, etc. 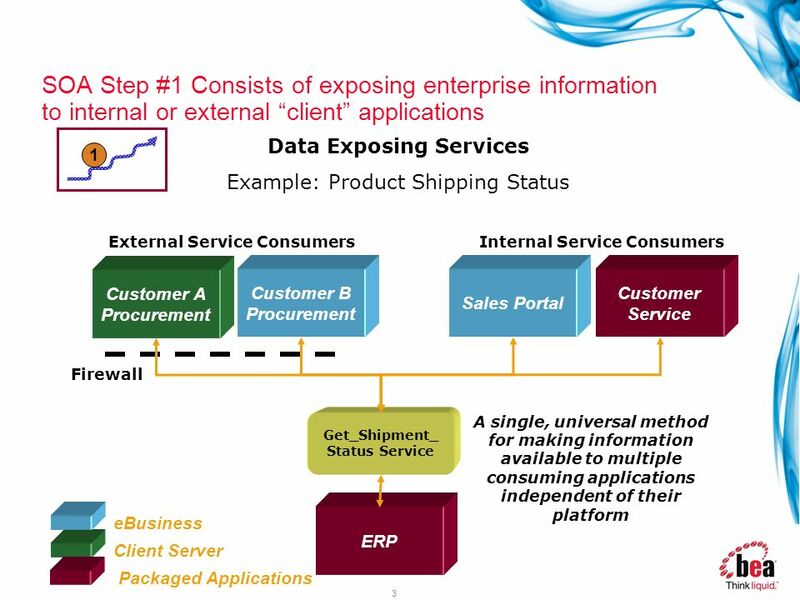 ERP, CRM, etc. 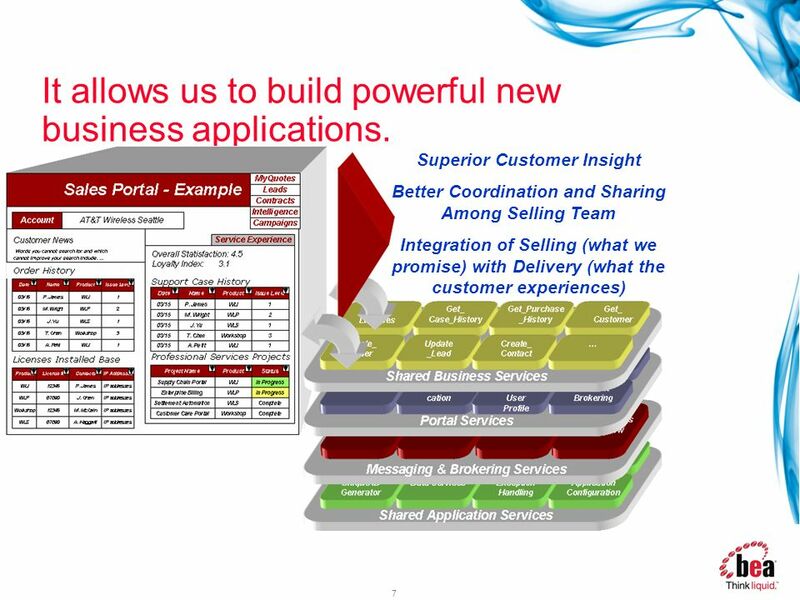 7 It allows us to build powerful new business applications. 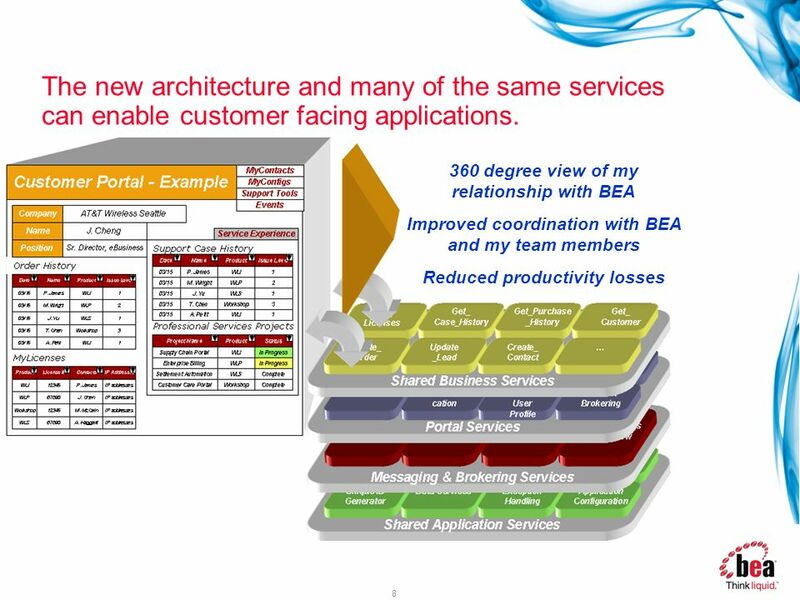 8 The new architecture and many of the same services can enable customer facing applications. 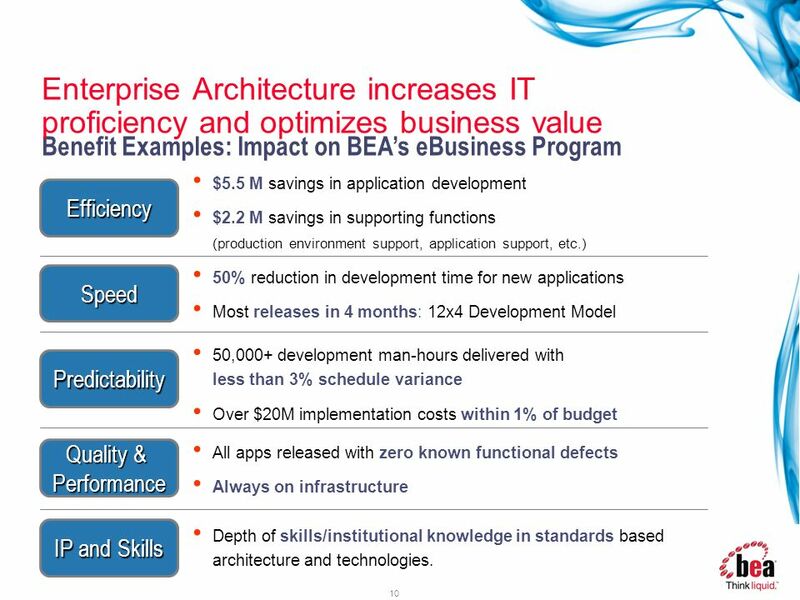 Enterprise Architecture increases IT proficiency and optimizes business value Benefit Examples: Impact on BEA’s eBusiness Program $5.5 M savings in application development $2.2 M savings in supporting functions (production environment support, application support, etc.) 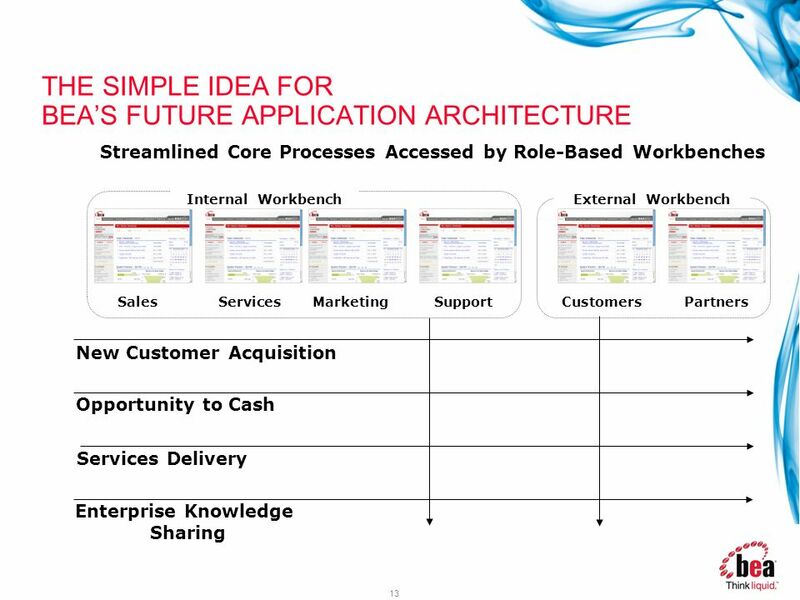 Efficiency Speed 50% reduction in development time for new applications Most releases in 4 months: 12x4 Development Model 50,000+ development man-hours delivered with less than 3% schedule variance Over $20M implementation costs within 1% of budget Predictability For the IT organization, the benefits of our architecture were many. 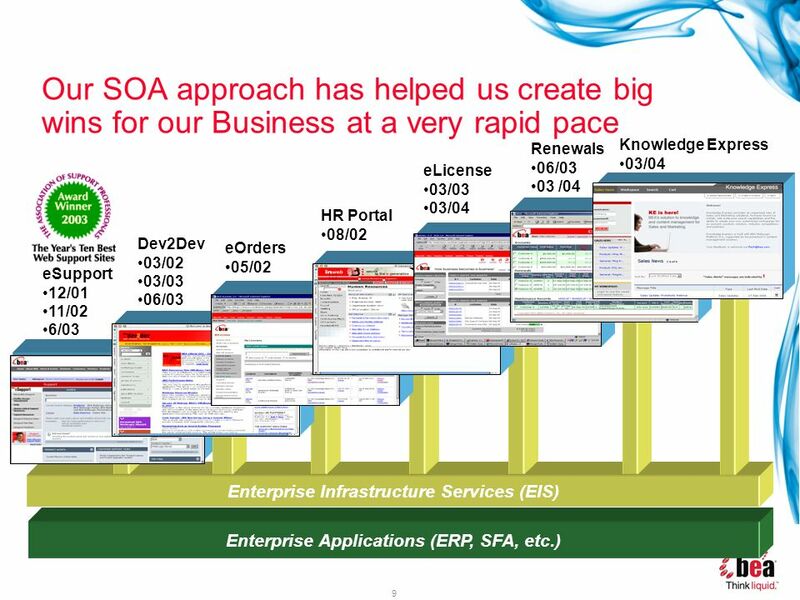 It helped us dramatically improve our delivery track record: we build a lot faster, better and cheaper than 2 years ago It also improved the quality of the service we provide our business Finally, as a CIO, I am always looking for ways to improve the skills and institutional knowledge of my organization. Creating an architecture with standard technologies and solutions certainly helped us develop deep skills and that is a key to productivity. 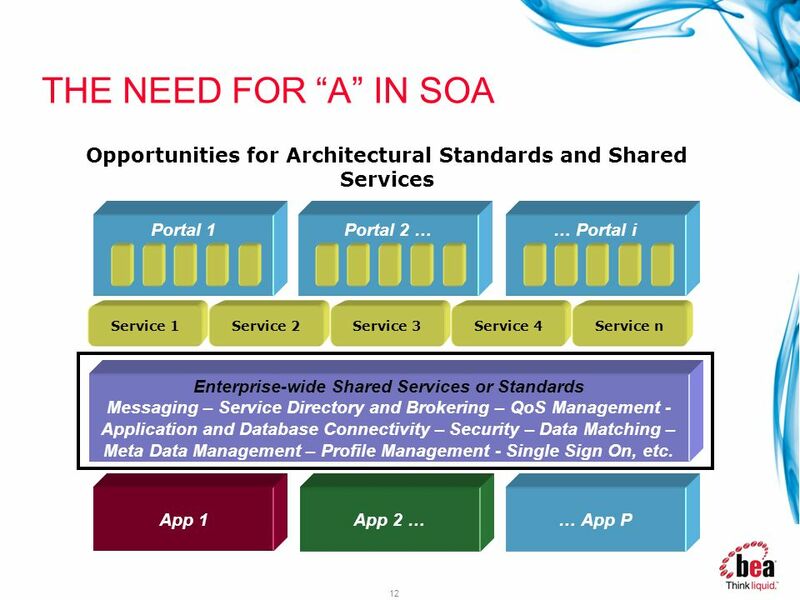 Quality & Performance All apps released with zero known functional defects Always on infrastructure IP and Skills Depth of skills/institutional knowledge in standards based architecture and technologies. 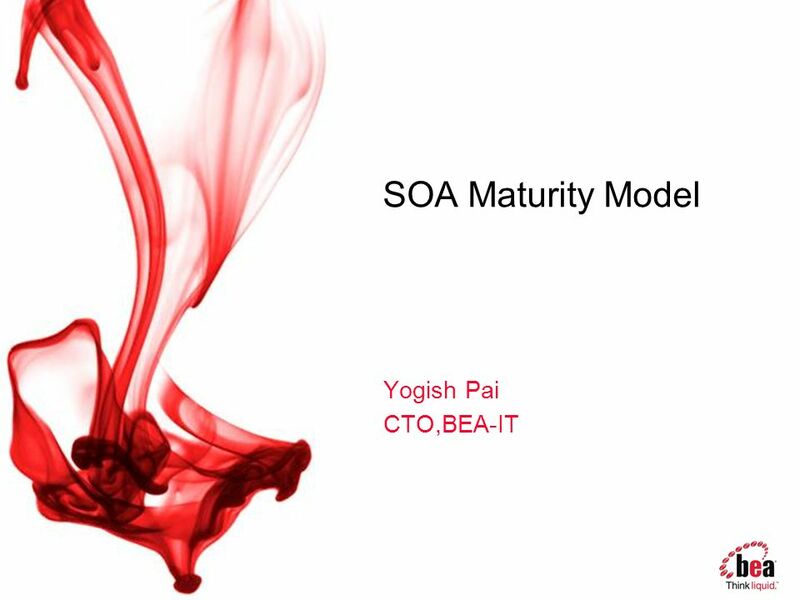 Download ppt "SOA Maturity Model Yogish Pai CTO,BEA-IT." 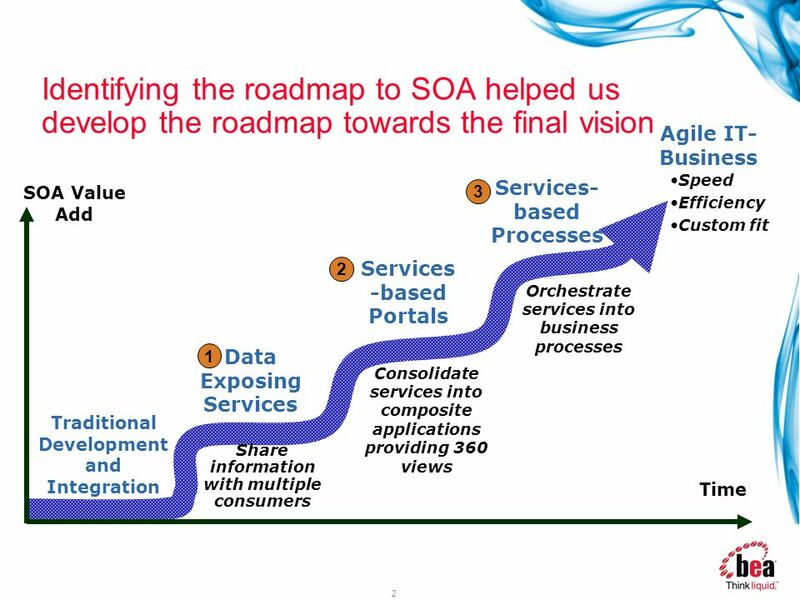 Creating a Framework for Innovation with SOA Bruce Graham Vice President, WW SOA Practice. Mobile Care Everywhere. 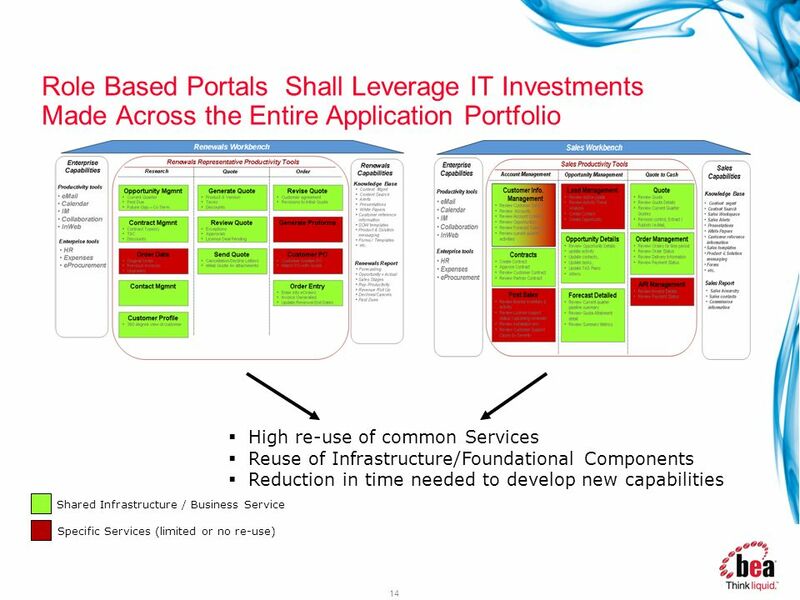 COMMUNITAKE CommuniTake provides operators with a comprehensive support platform including a native mobility VAS expansion aimed. Sales Organization Today Burning Problems and Challenges. 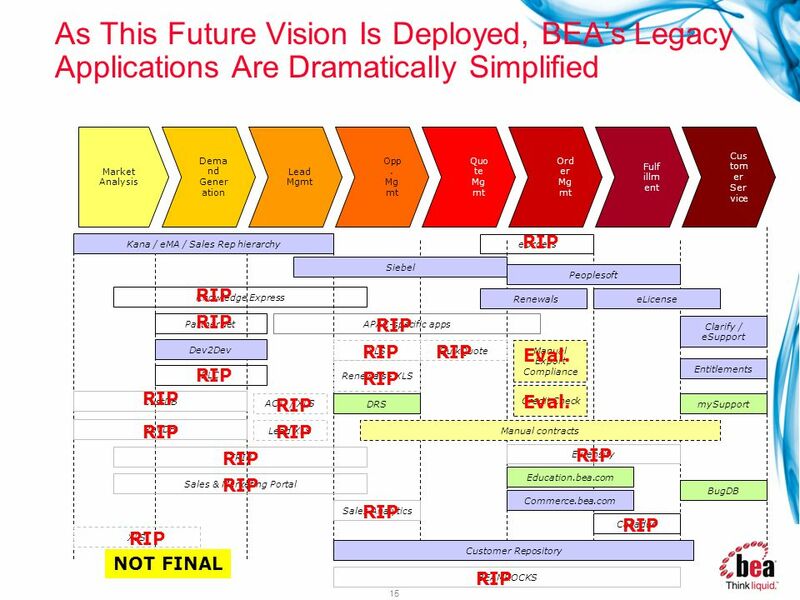 An Introduction to Endeavor Commerce History:Sage Premier Technology Partner since 2002, 2007 Endorsed Technology Partner Mission:Extending fast, accurate. 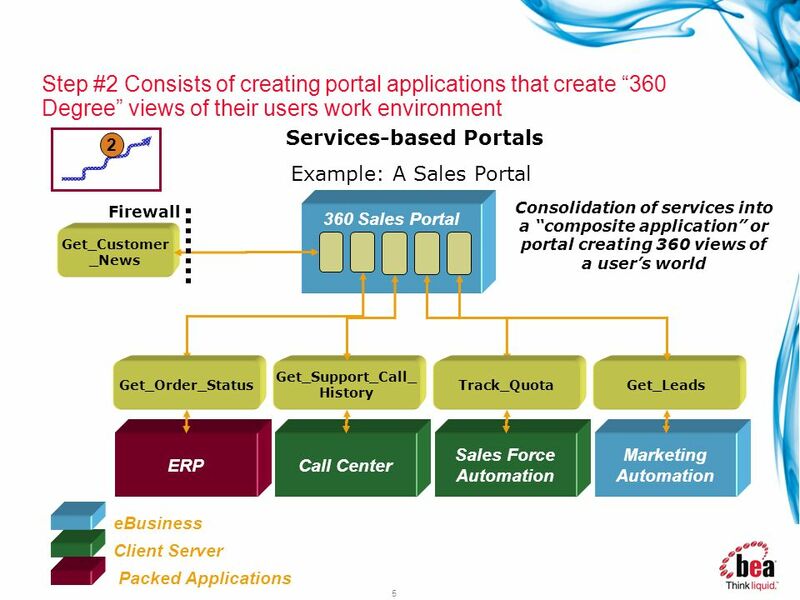 CRM Customer Relationship Management 1 Yapar & Vatandost - Dr. Deniz Aksen Mgis. 301 _Spring 20104/11/2015. 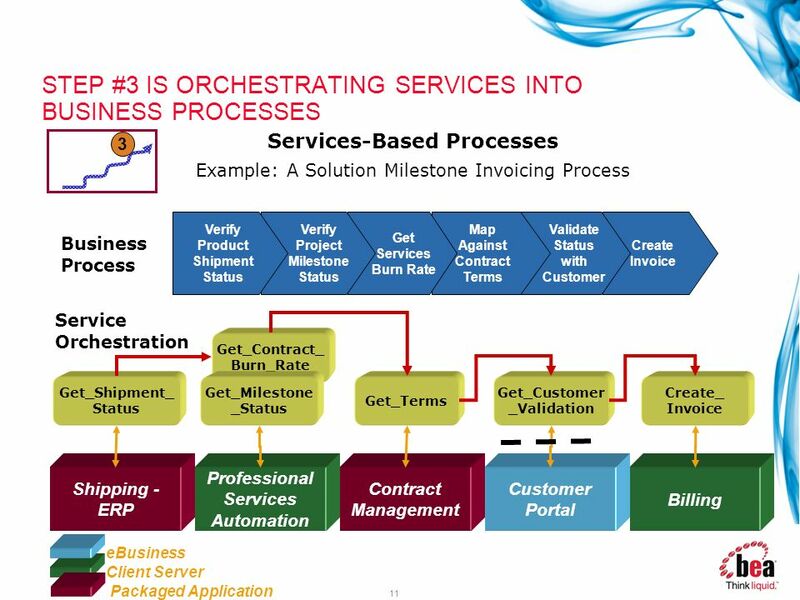 The Engine Driving Business Management in Project Centric Environments MAGSOFT INTERNATIONAL LLC. How eNet4S can benefit your project? 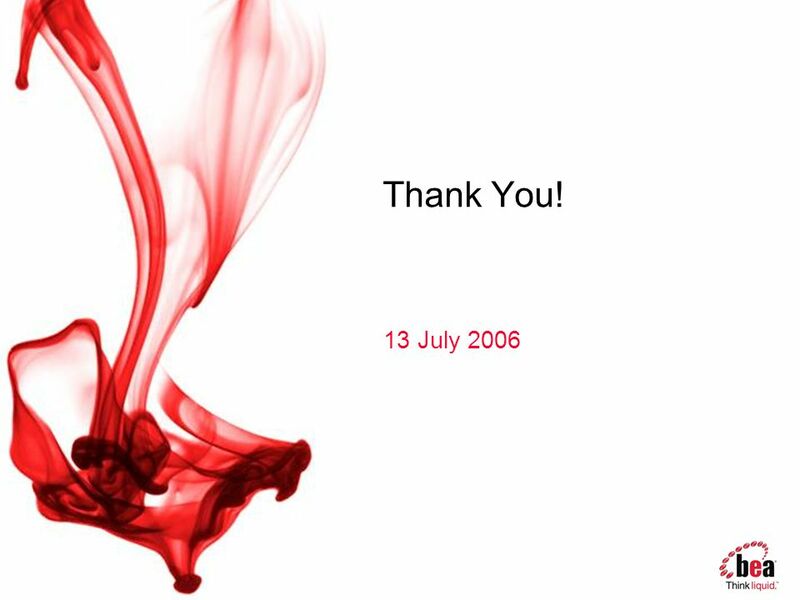 eNet4S Software Solution Business Team Chief Technology Officer July 11, 2006.